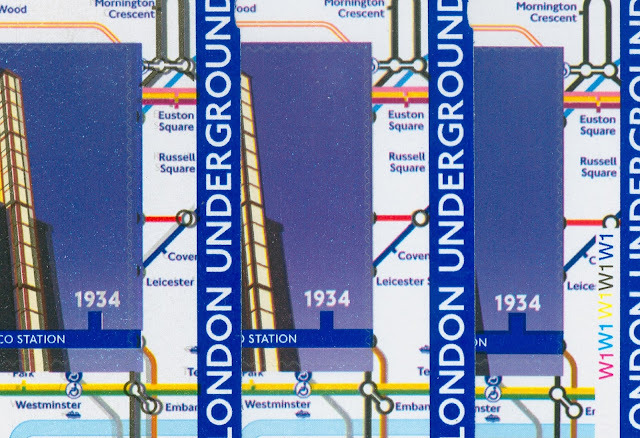 We reported earlier what appeared to be two different types of London Underground self-adhesive booklet stamp, as the dark blue 'caption' line seemed to be larger on some than on others. True comparison was not made easy by the (what have become) usual poor standard of registration on Walsall-printed boookets. Doug has sent us a further set of comparison image. For the record, though I no longer think the source is significant, these are from Tallents House, Stampex, and Harlow, Essex. Note that the Tallents House supply has a significant shift of the grey to the left, producing double-rings for station interchanges, a shadow on the diagonal Picadilly Line, and a double-track Northern Line (oh that it were so!) Note also the vertical white line below 1934 against the dark blue spur. The white numbers are achieved by leaving unprinted spaces in the printed area of the grey, magenta and cyan, a technique known as 'reversed out'. 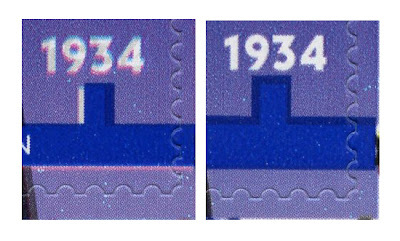 Clearly any misregistration (as on the left example) leaves a date with coloured edges, in this case grey, but regular readers will recall the magenta/white/cyan (or red-white and blue) face value on the 1st class Jubilee booklet stamp. the printers were concerned that the blue was a very tight fit with the reversed out text and could result in a white border showing. They used varying heat in the printing stations to adjust the print width of the blue and this has caused the variation in the two images – too much heat and the blue shrinks, too little and it spreads. Not ideal but preferable to a white border. And the reason why the mis-registration occurs in the first place is that the job has to go through the press twice and the heat and tension causes the paper to move. 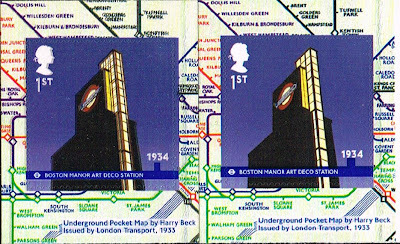 The “Boston Manor Station” inscription would also vary, and the spread of the blue would be consistent on both sides, not just the side with the spur. The alignment of the printing on cylinder books is correct, yet the standard of print is highly variable on the rest, which suggests that the tension settings on the stock are not correct. Could it be that cutting corners in the production of the Golden Jubilee booklets, to print to Olympic Gold Medal Winners stock, the production of the Paralympic Gold Medal; Winners base stock impeded the Christmas Booklet Printing and the production of the new colour definitive booklet, business sheets, reprints of robin, the 2nd class and the pond life post & go labels had an effect on the London Underground Books. Hopefully once DLR finishes their relocation, we may see Walsall producing less, but to a better standard. The Royal Mail need to get a grip and monitor the quality of the material that is supplied to them. 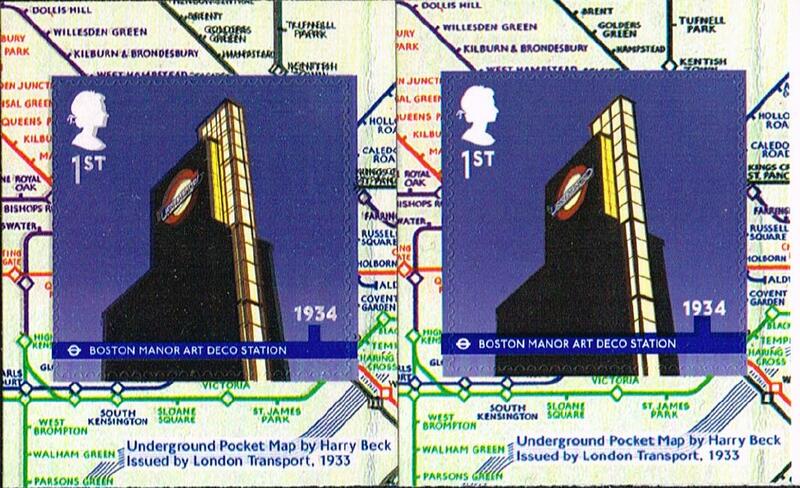 The “Boston Manor Station” inscription would also vary, and the spread of the blue would be consistent on both sides, not just the side with the spur." The vertical height of the blue line on the stamp does vary - see the right-hand stamp - but I hadn't considered the effect that there ought to be on the Boston Manor inscrpition. We've been told that Royal Mail are discussing with Walsall SP the poor quality of some of the material supplied, including the Robin Faststamp shown in another post. Actually, what's happened is a change to the artwork to make it more resilient to slight registration slips. The blue line has been given 'trapping' – specifically the 'spread' version. This made its outer edges slightly larger so that if there was some misregistration it would still cover enough to prevent showing a sliver of unprinted paper. The Royal Mail's explanation of it being due to varying heat in the printing locations sounds like 'Chinese Whispers' to me; something incorrectly repeated by someone who doesn't really understand the process. The actual artwork production method in the last example is clearly one that uses trapping. Otherwise, the white text in the bar (the word "STATION") would fill in whenever the print started to swell. Nope, this just isn't logical and it doesn't fit with anything I know about print production methods and behaviour – which is something I teach at university.